G Furniture and carpets on the Tuam road in Galway massive summer sale continues with huge savings across all departments. They guarantee the best value for money in Galway in carpets and furniture with a brilliant selection of new season rugs just arrived at sale prices. G Furniture and carpets offer free delivery and assembly service with all furniture sold, so there are no nasty hidden extras here. They stock beds from leading Irish bedding factories King Koil, Odearest, Sealy and Briody Bedding and with every mattress bought they will take away your old mattress free of charge. Irish made double mattresses start from €139 all in stock and ready for immediate delivery. 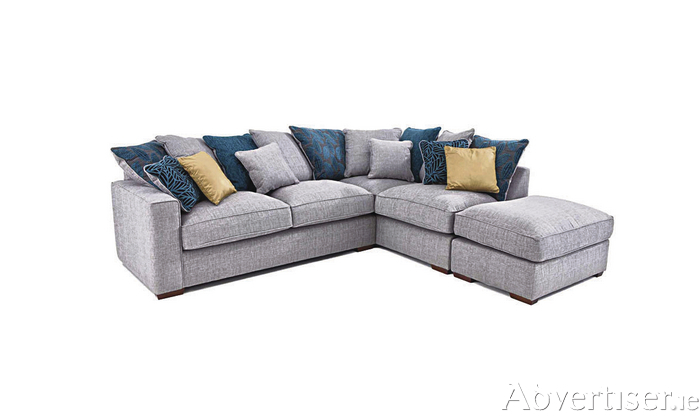 Fabulous savings are also available across a large range of sofas with the Dune large corner sofa(Pictured ) available in a range of colours at a great price. G furniture and carpets is headed up by the Declan Gannon, originally from Roscommon where they have a family furniture wholesale business. This helps them deliver better value for their Galway customers, delivering furniture at factory prices and sourcing direct from leading factories in Ireland and around the world direct to their Galway customer which allows them bring better value to their Galway customers. Their carpet division is headed up by Noel St John from Caherlistrane. He offers a free measuring and quotes service with a fitting service second to none with some of Galway's most experienced and best fitters. At the moment they have loads of in store specials on carpet and furniture with everything reduced. So why not call in and see where you can get quality furniture for less.